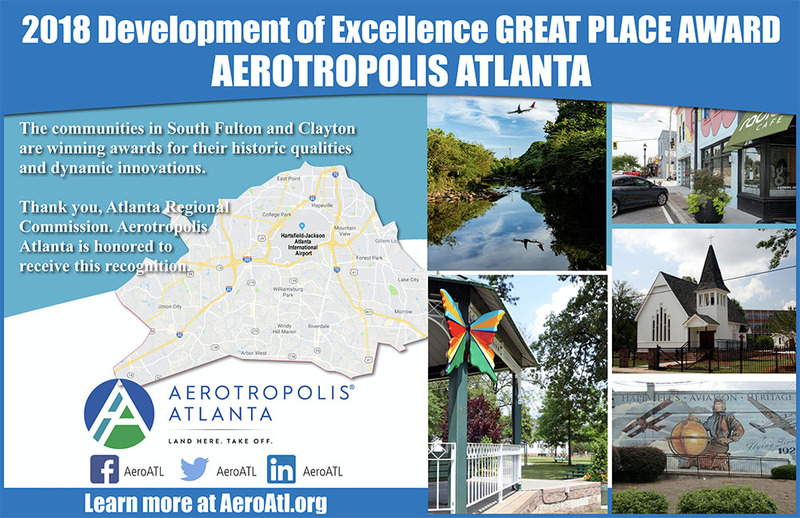 The Aerotropolis area was honored with a 2018 Development of Excellence Award in the category of “Great Place” today by the Atlanta Regional Commission (ARC), during the agency’s State of the Region Breakfast. “The Aerotropolis Atlanta Alliance has been working hard to make the entire Aerotropolis region a destination in and of itself, and our recognition by the Atlanta Regional Commission shows that the investment by our partners is paying off. -Shannon W. James Sr., President & CEO of Aerotropolis Atlanta Alliance, Inc. The world’s most-traveled airport. Charming, shop-lined downtown districts. Historic neighborhoods. Global business headquarters. Film and television studios. All of these can be found in Atlanta’s Aerotropolis area, a vibrant, dynamic part of our region. The area, anchored by Hartsfield-Jackson Atlanta International Airport, has long been the Atlanta region’s largest job center. In recent years, the Aerotropolis area has become home to new economic development engines large and small—such as Porsche Cars North America’s headquarters, Screen Gem Atlanta Studios, mixed-use projects like Gateway Center, and up-and-coming apartment communities like The Pad on Harvard. Several efforts are helping drive change in the Aerotropolis area. The Aerotropolis Atlanta Alliance, founded in 2014, is a public-private partnership that includes Atlanta’s airport and surrounding jurisdictions, corporations, and private businesses, as well as local chambers of commerce, educational partners. The Alliance, in partnership with the Aerotropolis Atlanta CIDs, has catalyzed a new era of cooperation that has brought positive change and revitalization to the area — with the promise of much more to come. Additionally, the effort has brought attention to many hidden gems in the area. The AeroATL Greenway Plan, an ambitious project that’s been compared to the Atlanta BeltLine in its vision and transformative possibilities, seeks to reconnect communities across the Aerotropolis area through greenspace and trails. This project will be a great complement to the Finding the Flint campaign, which focuses on the long-overlooked Flint River that runs under Hartsfield-Jackson Atlanta International Airport and is lead by Ryan Gravel and Hannah Palmer.